The first shoes were sandals. Some clever person invented them around 10,000 years ago. But people in ancient times weren’t impressed by the shoe. Egyptians, Hindus, and Greeks all preferred walking barefoot. Shoes were self-indulgence; they were unaesthetic and unnecessary. Even Athen’s athletes competed in the Olympic Games barefoot. And Alexander the Great conquered Persia, Egypt, Syria, and Mesopotamia with a barefoot army. Things changed with the rise of Rome. To the Romans, clothing was a sign of power. Slaves and beggars might be barefoot, but a civilized person wore shoes. While some early versions of the shoe were made of papyrus, most shoes were crafted from cowhide, bearskin, deerskin, and wood. The first rubber-soled shoes date back to 1876 in England. By World War II, synthetic-soled shoes were commonplace. And we, as a people, haven’t recovered since. So What’s the Problem With Shoes? Where to Get Earthing Shoes? Every household outlet has a ground wire. (It’s the third prong; that semi-circular hole beneath the other two prongs). In case there’s a short circuit, the ground wire provides a path for an electrical current to be absorbed into the ground. Without a ground wire, your body touching the device (an electrical box, appliance, power tool, etc.) may complete the ground path. This causes a shock, if not an electrocution. Earthing means connecting your physical body (skin layer) to the Earth. The theory is that earthing allows a transfer of negatively charged electrons from the Earth’s surface into the body. Earthing creates a grounding connection between your body and the Earth. If you recall from high school physics, substances called conductors allow electricity to travel through material easily. Others substances called insulators inhibit the flow of electricity. If you’re outside during a lightning storm, it’s best to get into your car because the tires are rubber. Rubber is an insulator; it protects you from lightning that strikes the ground. The rubber-soled shoes insulate us from the electromagnetic field of the Earth. Why does that matter? An excess of free radicals damages our cell membranes and DNA, leading to cancer and other diseases. Earthing has shown to reduce blood viscosity (thickness) and inflammation, suggesting that it supports cardiovascular health. Most of us have an overactive sympathetic nervous system (excessive emotional stress). Preliminary studies show that earthing has a calming and balancing effect on the nervous system. The moment your foot touches the Earth, or you connect to the Earth through a wire, your physiology changes. An immediate normalization begins. And an anti-inflammatory switch is turned on. People stay inflamed because they never connect with the Earth, the source of free electrons which can neutralize the free radicals in the body that cause disease and cellular destruction. Earthing is the easiest and most profound lifestyle change anyone can make. A growing body of research suggests that earthing helps heal humans from a wide variety of ailments. Earthing will also greatly improve your sleep. From my experience, the benefits of earthing go far beyond healing disease. I believe earthing has unspoken mental and emotional benefits essential for psychological development and peak performance. Earthing helps quiet the mind and bring you back to your center. It brings about a state of inner calm, providing greater mental clarity and alertness. The easiest way to ground yourself is to stand or walk barefoot for a minimum of 20 minutes each day. But we can’t always walk barefoot. 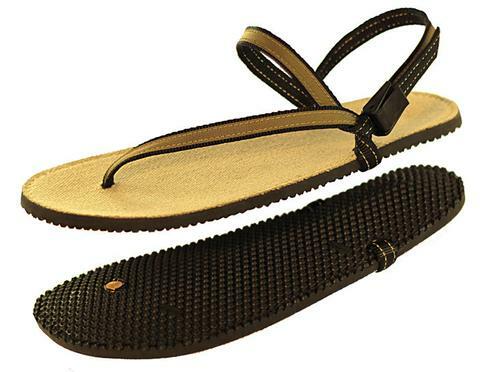 To turn regular shoes into earthing shoes, you need to introduce a conductive material like copper or carbon into the footbed. I was skeptical when I first heard about earthing shoes. I had experienced the positive effects of walking barefoot. Ten minutes of walking on my gravel driveway and I feel more calm, alert, and present. But could you get similar benefits from earthing shoes? EMF specialist Lloyd Burrell and others have tested various grounding shoes with voltage meters, and yes, they work! This California-based company makes an innovative line of minimalist sandals using a super-thin Vibram sole, a hemp or leather insole, and a copper plug (below the big toe) with a conductive strap that connects your feet to the Earth. Adjusting the sandal can be a little tricky, but once you do, they’re easy to take on and off. I appreciate that they offer a canvas footbed so your feet aren’t making contact with rubber or some other synthetic material. This video shows this earthing shoe’s grounding effects using a voltmeter. Keeping your feet connect to the earth or using conductive footwear (earthing shoes) has tremendous benefits for our health and personal performance. But there are even more benefits available to us. You can assist the grounding process by aligning your posture and sinking your energy down into your feet. I provide detailed instructions on how to do this using a Chinese method called Zhan Zhuang. Ground yourself as often as you can. You’ll feel the difference: a more relaxed body and a calmer mind. Earthing Sheets: Do They Really Help Improve Your Sleep?